When you picture wall mounting your TV, you might think of a seamless, easy, 15-minute fix. But then reality hits. You might miss the wall stud and end up with an unstable TV. Or maybe you couldn’t find your trusty level, so you skipped that step and now your TV’s lopsided. Not to mention you’ve had to book a visit to the chiropractor too because you threw out your back picking up a flat screen TV all on your own. Worst of all, you missed happy hour with your friends because you thought it would “only take a minute”. The best way to avoid messing up your TV, your wall, and your weekend plans is to get your TV installation done by a TV wall mounting service provider. But in case you really want to DIY your TV installation, we’ve put together some steps and resources below. Because while we’re pro TV wall mounting service providers ourselves, what we really want is to make sure you get the job done safely (even if you end up DIYing). 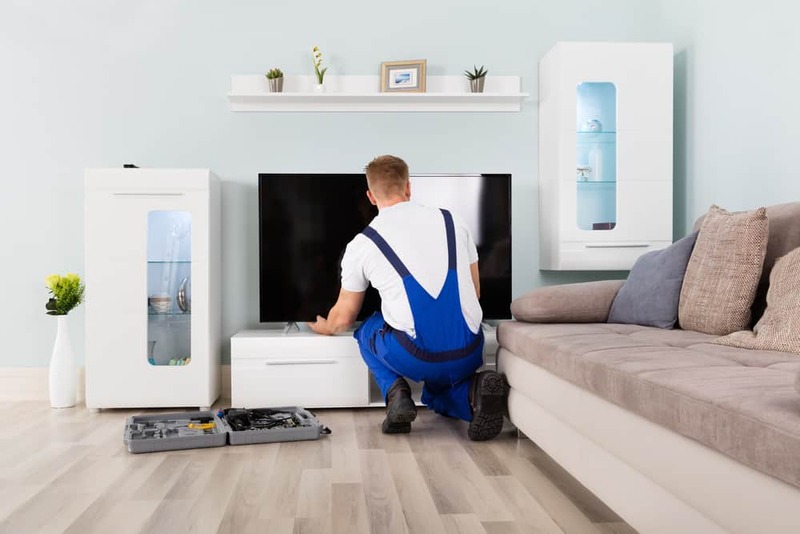 Whether you’re thinking about DIYing your TV installation, or you’re curious about what’ll happen when you technician turns up for your TV wall mount service, these steps will take the mystery out of what’s involved in the process. Check your TV and make sure it’s wall mountable. Most of them are. If your TV is VESA compatible (able to be wall mounted using standard mounts), it’ll have four holes in a rectangular pattern on the back. You’ll need to choose a TV wall mount that fits your specific VESA hole pattern. Also, consider the type of TV wall mount that’s best for your space and how you prefer to watch TV. You can choose from a variety of styles, including fixed, swivel, tilted, sliding, corner, ceiling, and full motion. Find out more about choosing a TV wall mount in our previous article, How to Figure out What Kind of TV Wall Mount You Need. Next, think about the location of your TV. Once it’s fixed on the wall, it’ll be tricky to move, so think about long-term usage and how you use your space. Consider glare from lights and the location of the sun throughout the day. For lounge room TV installations, you’ll probably want your TV to sit at approximately eye height when seated, and directly in front of most (if not all) of your couches. Another factor to consider is the location of any power points and TV wall points. If they’re on a different wall to where you’re planning to wall mount your TV, you may need to get additional points installed to avoid unsightly cords. For more preparation tips before you start your TV wall mounting service, check out our guide on How to Get Ready for Your TV Installation. The exact process for wall mounting your TV will mostly depend on your wall type. To keep things simple, we’ll just cover the most common wall type – plasterboard or gyprock. If you want more info on how your TV wall mounting service will work for different types of walls, check out our Guide to Mounting a Television: Wood studs, Metal Studs, or No Studs. You’ll need to find the studs on the wall. These are vertical pieces of timber framing inside your walls. It’s important to attach your TV bracket onto wall studs if possible because between your TV and your wall mount, you’ll have anywhere from 20-50kg hanging on your wall. To find the studs, you can use a stud finder or gently tap on the wall with a hammer and listen for where it’s solid. Mark the location of your studs with a pencil. Attach the wall bracket component to your wall where you want to install your TV. Use the bolts provided with your TV wall mount kit to secure your bracket through the wall studs. Use a spirit level to double-check your bracket is sitting straight. Then attach the mounting rails onto the back of your TV, matching it up with the VESA holes. If you’ve selected the right TV wall mount for your TV type, this should be a perfect match. Connect the mounting rails (attached to your TV) to the wall bracket (attached to your wall). The way you hang your TV will depend on the type of TV wall mount you’ve selected (e.g. swivel, fixed, or corner). But for a basic fixed TV wall mount, you’ll usually need to slide your TV downwards onto the bracket until it connects. Then you’ll need to screw in the additional safety screws provided that hold your TV securely in place. Note: you’ll need to get another person to help you with this step, especially if you’re installing a heavy TV. Finally, connect any cables needed to finish off your TV wall mounting service. This will include the power cable, antenna connection, plus any consoles and sound systems you use with your TV. Ideally, all your cords will be contained behind your wall mounted TV, but if not, you can tidy them up with a cord cover. A quick clean up and your TV wall mounting is done! Time to relax on the couch and enjoy some shows with your new, upgraded view. Maybe you read the steps and factors above and feel like a TV installation is just too much effort right now. Plus, you never know when an unexpected problem will pop up during a DIY installation. If you’re not experienced, you might not recognise the problem until it’s too late, or you might not know how to deal with it. Find out more about potential problems in our previous article, 17 Common Digital Antenna and TV Installation Problems. But TV wall mounting doesn’t have to be hard or stressful, especially when you can hire a professional TV wall mounting service provider to manage it for you. A professional will know exactly the right steps, tools, and processes to use for your TV wall mounting service to ensure you get the best result. They can take care of everything from advising you on the best TV wall mount to the best location for your TV, and then help you with any additional services and installations you might need. That means you won’t have to skip happy hour or head to the chiro after all! If you’d like to get professional help with wall mounting your TV, reach out to our friendly team at Install My Antenna. You can call us on 1300 800 123 for a free quote or to book in your TV wall mounting service today.